In the book Marketing Metrics, the authors share a fascinating finding from their research: The probability of selling to a new prospect is 5-20%. The probability of selling to an existing customer is 60-70%. Instead of spending more effort finding new clients, why not sell more to your existing ones? The word upsell doesn’t have to be a sleazy word as long as you’re providing extra value your customers actually want. Think about your favourite pair of jeans. If you were outstandingly satisfied with your purchase, you’re more likely to buy a pair of socks, shoes, and belt from the same brand/store as opposed to a new one. You’ve developed a positive relationship with that brand/store thus are likely to purchase more. That’s the power of an upsell. The upsell for B2B/Saas solutions email is meant to add to the services. These emails offer premium services or upgrades for users on paying, free or trial accounts. Upsell emails for B2B/Saas solutions are meant to extend the usability and functionality of the software. This can include things like paid apps, integrations and extensions. Use plenty of visuals to communicate the benefits of upgrading or adding to the functionality of the software. Highlight the benefits with hard data, statistics or case studies. Wix, the simple website building service, uses this email to upsell apps to extend the functionality of their website service. These apps are an extra cost on-top of Wix’s software. This is an upsell email from the wonderful printers at Moo. For a little extra you can have your business cards printed with rounded corners. 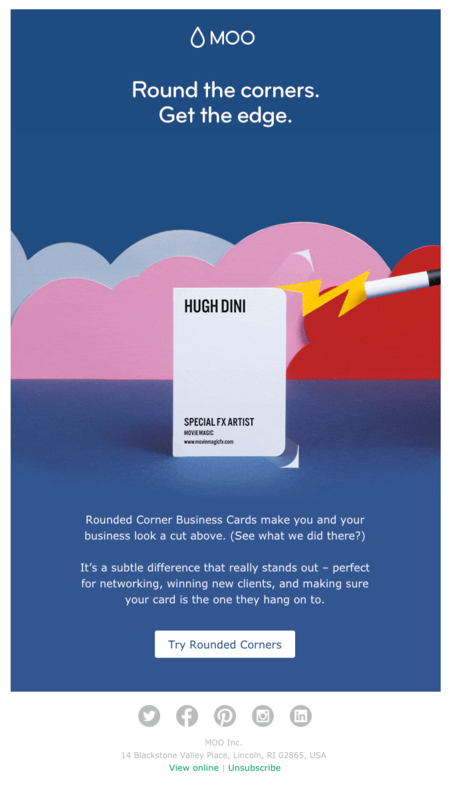 Moo uses bold and colourful visuals to show off the style of their rounded business cards. This email drip upsell reaches customers who may want to improve the look of their business cards and upgrade to a more premium print. For Fitbit users that want to track even more of their life, they can upgrade and try their new sleep tools. For potential customers this is new software and tracking tool is a upsell for the newest versions of the Fitbit product. Users with old versions of a Fitbit tracker, new apps are an incentive to upgrade. Instead of finding your own freelance opportunities on Freelancer you can upgrade a use a recruiter to find jobs. Freelancer goes beyond the Saas model and offers a personal recruiting service in this upsell drip campaign for Freelancer users. Skillshare the online education platform uses this email to upsell its premium service. By showing relevant courses you can master, it promotes its premium service as an upsell to its regular service. Lumi, the fool-proof packing program, is upselling an entire custom packaging system for less than $2 a package. They attach educational content to their emails to support their offer. By putting their blog content front and centre, recipients aren’t blatantly sold to but are softly upsold towards purchasing a full packaging system. 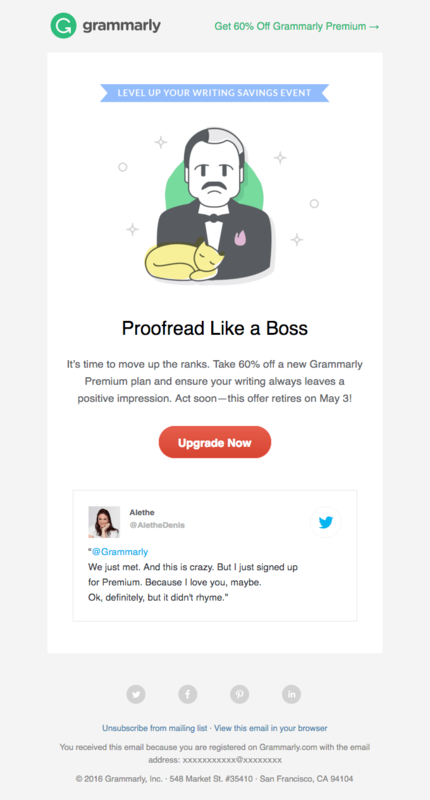 Grammarly wants you to level up your writing with 60% off a premium account in this email upsell. Grammarly’s use of persuasive language “Proofread like a boss” and “It’s time to move up the ranks” to move recipients towards upgrading. They make sure to include a firm timeline of May 3rd before it expires. Upsell email campaigns based on purchase behaviour are sent customized by recent or past purchasing behaviour. These emails are set up to be sent once a user performs some sort of purchase behaviour. For example products related to a recent purchase or an abandoned shopping cart. Highlight past purchases to relate your upsell offer. Provide suggestions and helpful content that supports your new offer. 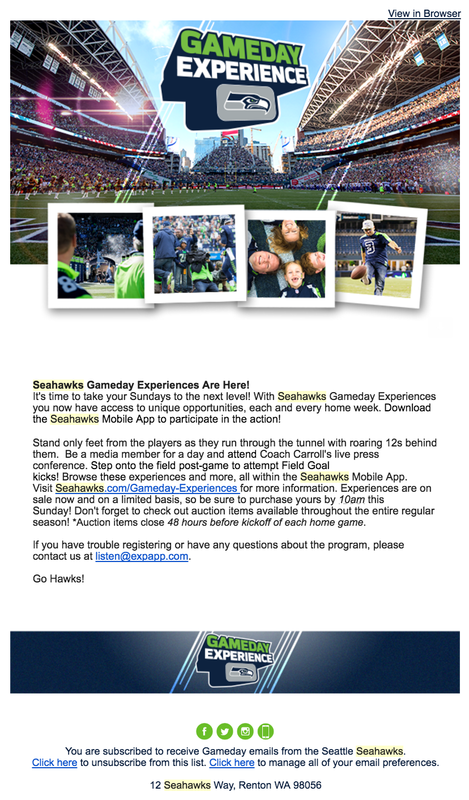 Based on previous ticket purchases, the Seattle Seahawks assumes in this email that the recipient would also enjoy another Seahawks gameday experience. They go on to elaborate on the gameday experience and the feeling of a Seahawks game. Because this is based on previous purchases these recipients are more likely to purchase again. Appeal to some nostalgia to remind them of their last positive interaction with your business. 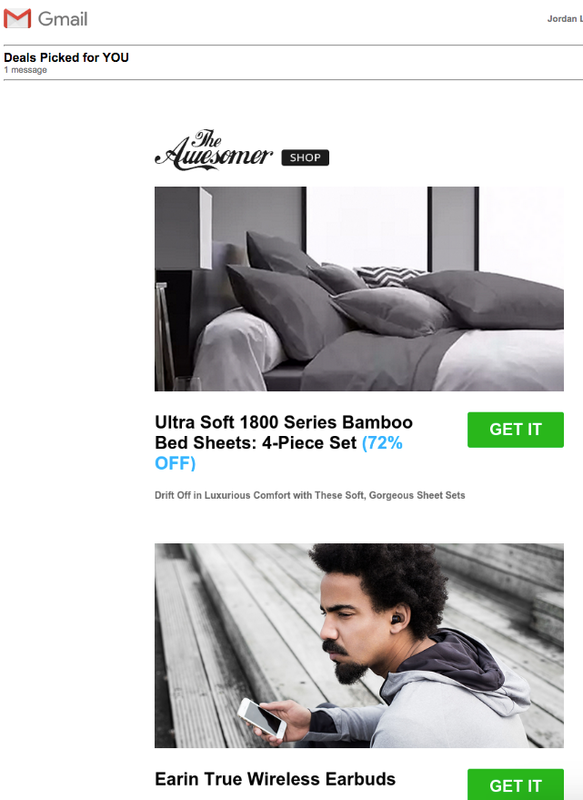 The Awesomer sends out “Deals picked for YOU” in this email and fills it up with products related to previous browsing and purchase history. Using past browsing and purchase history is a tactical way to upsell similar products. Combine that with a tantalizing discount and you set yourself up for plenty of sales. This is an abandoned shopping cart email from Sephora that reminds visitors that they still have items left unpurchased. Sephora uses this opportunity to upsell even more with links to top-rated and weekly special items. Canopy uses visitor browsing history to suggest relevant products in this weekly email. If certain products drop in price they’ll send out emails to visitors who showed interest in them. Beautiful imagery and price comparisons all add to the persuasiveness of this email. Airbnb goes an extra step further by offering their users free stay credit based on previous locations they’ve browsed. This gives users an extra incentive to book vacations and use Airbnb for their stay. Airbnb is sure to include their excellent city guides to push the recipient towards a conversion. Upsells attached to transactional type emails. These emails are sent after a transaction is completed. Upsells are attached to these emails to persuade a customer to purchase more or supplement their purchase. Highlight the transaction first and foremost. Provide options to supplement their purchase. Use bold imagery to show what other options are available. This is an order confirmation from DollarShaveClub that takes the opportunity to upsell more skincare products. Before the order is shipped out, customers can take the chance to add more products to the box. The email does a great job of showing other products the customer might enjoy and makes it even easier to order them. Once you book your vacation with Priceline you’re able to add-on more right from this transactional email. Add in rental vehicles or extra night stays. 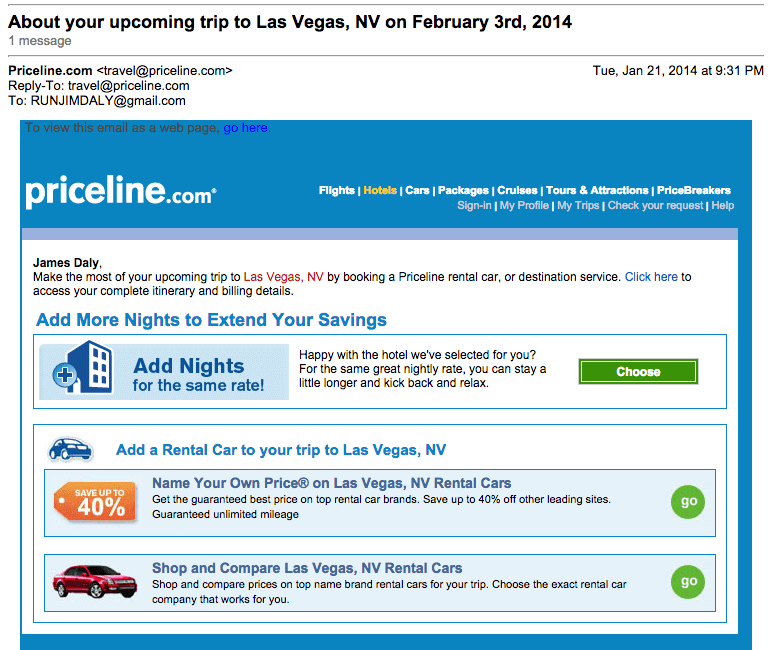 Priceline makes it dead simple to extend your vacation experience straight from your inbox. In this transactional email from Moo they take the opportunity to present their other types of services — greeting cards. They want to show that aside from the business cards you just ordered, they do greeting cards as well. When you purchase a t-shirt from TeeSpring you’ll get to see what other kind of tees the seller offers in their order confirmation email. These are t-shirts that other customers bought that you may also enjoy. It’s a great way to upsell shirts from a designer who’s work you already admire. Based on the product you just ordered from HuckBerry, you might enjoy one of the items they include in their order confirmation email. HuckBerry upsells ‘trending gear’ to customers who enjoy their outdoorsy style and branding. If you’ve funded a campaign on Indiegogo then you’ll receive your confirmation email plus the option to explore other trending campaigns. You’ll be able to ‘help bring more campaigns to life’ in this transactional upsell from Indiegogo. If you love to support inventors and creators then this upsell will be particularly enticing. Bought a handcrafted good from a maker on Etsy? Then you’ll receive this confirmation email with a short bio of the shop owner as well as other products they make. If you ordered one product from this maker, chances are you’ll enjoy something else made by them. If there is one company that knows how to control every aspect of the customer experience it’s Apple. They provide every piece of hardware you need to experience their product in the best of ways. If you order a laptop you’ll be upsold with external hard drives, Beats headphones and gift cards to purchase more Apple gear. A milestone email is sent when your customer or user achieves a certain milestone for example, number of files saved, number of photos taken, number of coffees purchased. Milestone emails are typically sent once a customer hit a specific milestone. These emails are meant to build stronger relationships and to encourage customers to continue using/subscribing/buying your product or service. Highlight the customer first and foremost. Reward them with something that shows your appreciation and encourages them to continue using your product/service. The purpose of these emails is retention so show that you appreciate them in the best way possible. RunKeeper tracks all the miles you log out on the pavement. Once you hit a certain amount of miles or run on consecutive days they’ll send you this type of email to encourage you to keep going. 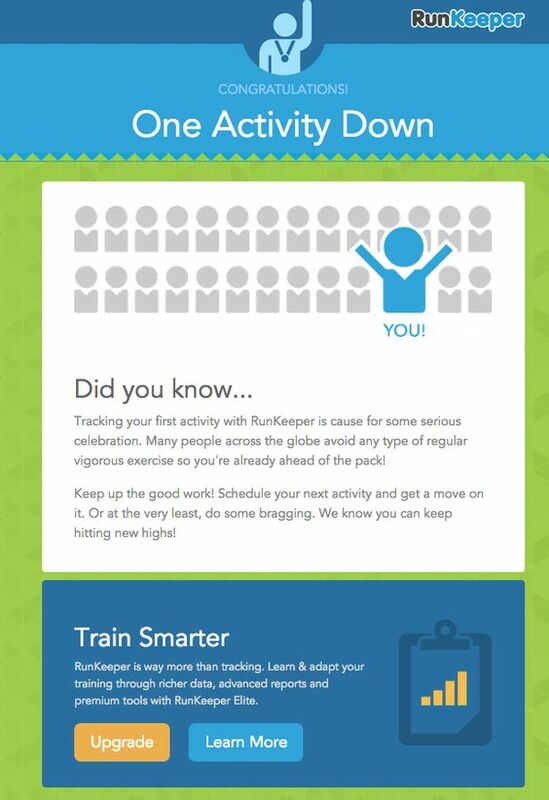 RunKeeper will also combine these milestone emails with the option to upgrade for more functions and features. This upsell works by encouraging you to keep running and to upgrade for more tracking. These emails use positive reinforcement to keep you positive and hungry for more. 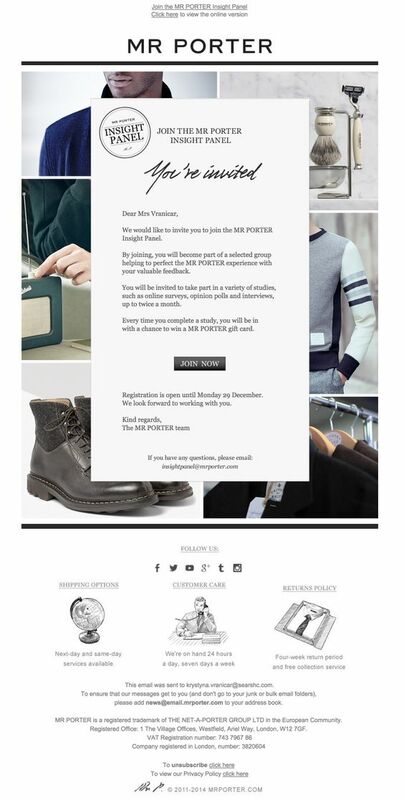 Regular shoppers on Mr. Porter are given the opportunity to join the “insight panel”. This exclusive group’s purpose is to improve the Mr. Porter experience but more importantly, use feedback to sell you more product. It’s a milestone email to make you feel special and ultimately create a more defined picture of what you’d like to shop for. This Grammarly milestone email highlights a weekly writing update to show you how it’s helping to improve your writing. It breaks down your problem areas and offers suggestions on how you can improve. They use your data to suggest an upgrade to a premium plan for more data and insights. “Fully protect yourself from writing mistakes by activating all 4 Grammarly features”, says the upsell portion of the email. If your writing is still poor an upgrade could help you improve, hence the upsell. 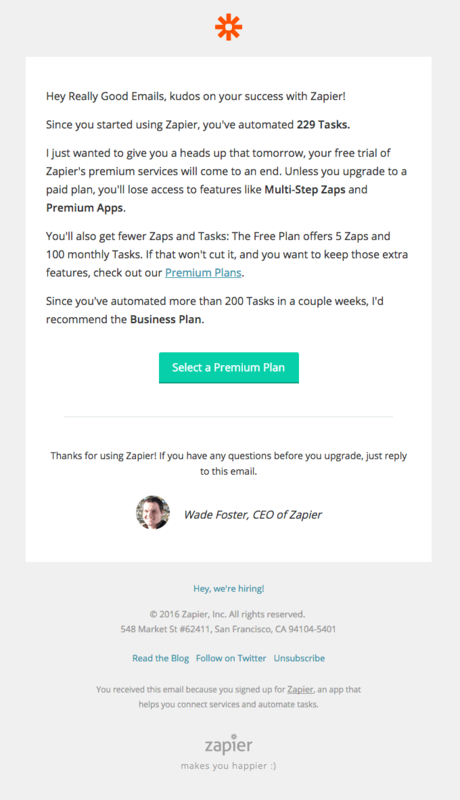 If you’re automating tasks with Zapier on a free account you’ll receive this email telling you how many tasks you’ve automated so far. They’ll highlight how efficient you’ve been and present an offer to upgrade to a premium plan or lose most of your zaps. Zapier wisely shows you how well you’re doing and then says you’re going to lose all of that unless you upgrade. The activity tracking app Human sends out these milestone emails to retain users. In them they describe you total activity and includes a few upsells to a visual diary and active wear. The friendly design and helpful visuals are powerful incentives for users to continue to use the app. HelloBar sends out a performance review in their milestone emails. In them they’ll tell you how well your HelloBar is doing at collecting clicks and leads. If you’re not satisfied or need a bit of a boost you can upgrade to HelloBar Pro for more advanced features. 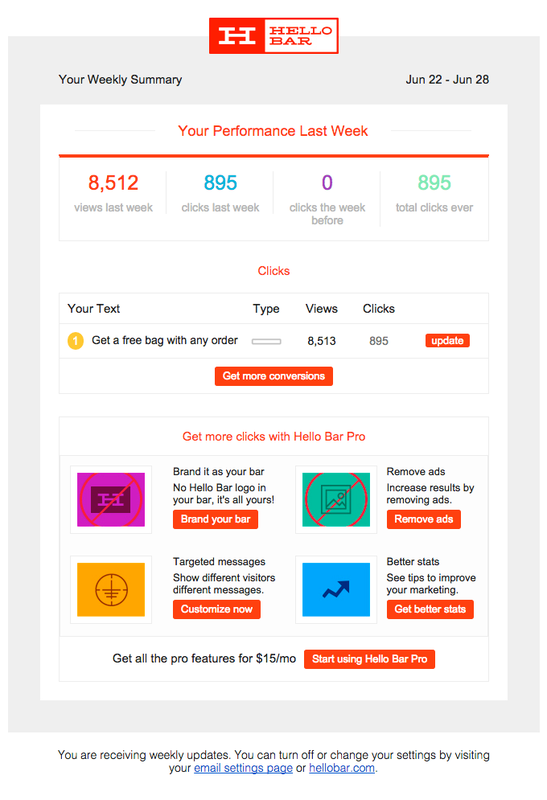 HelloBar’s milestone email is perfectly optimized for upsells; action oriented CTAs and a vibrant list of features. Upgrading to HelloBar Pro is hard to ignore. Click below to download the most comprehensive collection of email drip campaign strategies and examples ever compiled. Completely free.